"The temptation we have (as reporters) with these stories that happened 5 years ago or 10 years ago or 40 years ago is to summarize what happened and they turn into clip jobs. But what made this kind of different was the ability to sit down with all these participants," McKinney said. Those participants included the former first lady Patti Blagojevich, federal agents who went to the Blagojevich home to arrest him and others who were close to the story. In many cases, those interviewed let down their guard. "With the luxury of time, I guess people feel free to open up," he said. Take Patti Blagojevich for example. McKinney spoke with her for 6 hours. "That's when you begin to hear things like how the Blagojevich's youngest daughter, with all this talk of Rod possibly coming home early and nothing evolves from that, she stopped reading his emails from prison because it's just too hard to take." Much of the Patti Blagojevich conversations happened in the couple's home on the northwest side of Chicago -- the same home where agents came for Rod Blagojevich in December of 2008. Those agents were also interviewed. They told of planning their approach to the home in a nearby pancake house and how their initial call to tell the then-governor they were coming to take him into custody was thought by the Blagojevich's to be a prank call. "I hung up on them," Patti Blagojevich recalled. McKinney has the first episode available for download. More are on the way. The project is expected to run for several more weeks. But don't hold your breath waiting to hear from the former governor. Efforts were made to interview him. "It appeared he was on board with it," McKinney said. "And then the next thing we know is Blagojevich wants to talk with his lawyer." That was during December, when there was renewed speculation that President Donald Trump might consider commuting Blagojevich's sentence. 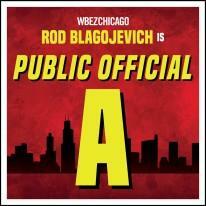 Patti Blagojevich has been on a media blitz to tout her husband's cause. Was McKinney concerned about giving a platform to a convicted felon? "I think had we just stuck with interviewing (Patti), that would have been a concern. But this podcast and the whole project is much more involved than that," he said.